Life of Shula: Smooth that frizz! I’ve always been a girl who obsesses over anything facial or hair related items, so when I went to my local supermarkets I went a bit crazy and bought a few things that I liked the look of and decided to buy. I have never tried the Andrew Barton 'SMOOTH THAT FRIZZ' hair products before, not only do they smell amazing but they make your hair super soft. I also bought the 'nspa' scrub and body lotion to try, I've tried the 'nspa' face masks before but their body lotion and scrub sounded amazing, looked amazing and smelt fresh and new. 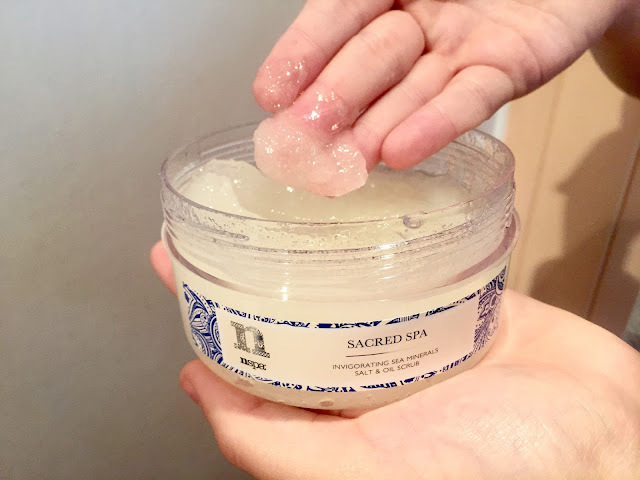 The first product I tried was the 'nspa sacred scrub' which was a smooth jelly texture, the grains in the mixture were invisible until you started to applying it to your skin. This scrub really did feel like it got down in your skin as you massaged it in. When I washed the scrub off, it left my skin so soft and feeling fresh. After I finished with the scrub, I applied the 'nspa sacred spa body lotion' not only did this formula smell fresh and new, the application was lovely, once you massaged it in, my skin was super soft and felt amazing. 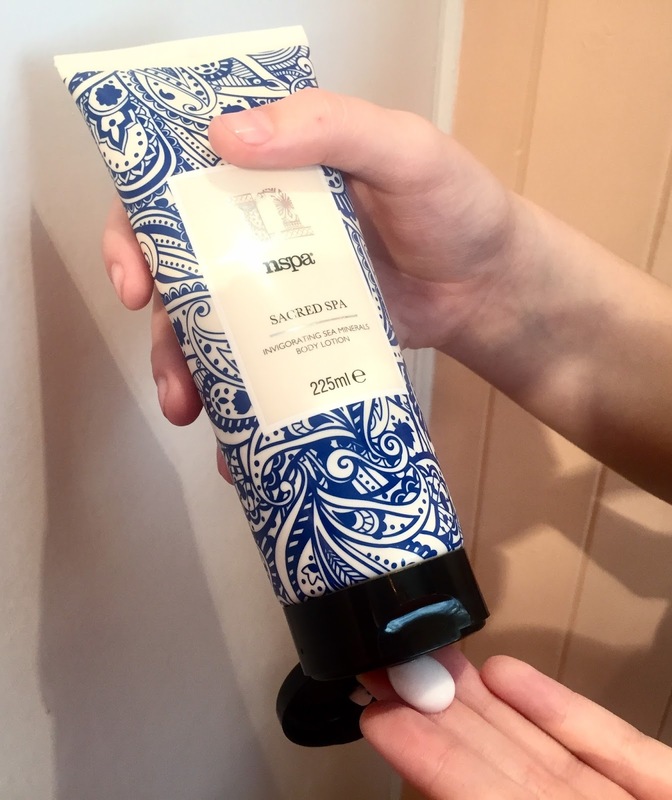 When you first apply the body lotion it applies a little bit like soap but once you continue massaging the lotion in, it seems to melt in your skin making you feeling amazing. shampoo itself was a clear grey colour but once interacted with the water, the scent was a fresh scent. The shampoo washed away very well, I did rinse my hair three times as that was what the bottle told me to do. 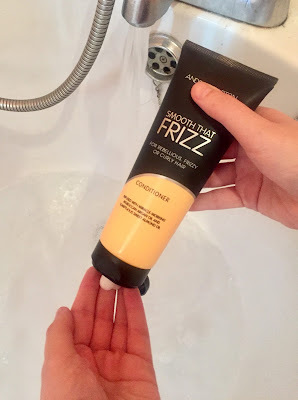 After shampoo, I conditioned my hair with the 'SMOOTH THAT FRIZZ' conditioner, The conditioner was white and quite creamy once mixed in to the hair but didn't feel heavy on the hair at all, it was a very light formula. I let the conditioner sit on my hair once it was evenly spread over my hair for a minute. 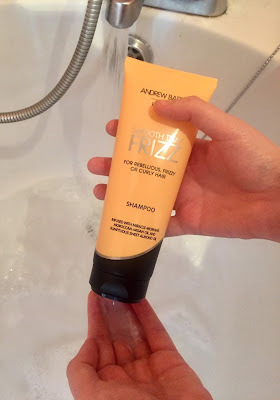 This also washed off the hair nicely and left my hair feeling super smooth and soft. Once I finished I used the 'SMOOTH THAT FRIZZ' Gloss Serum (which is the small clear bottle you see on the very first photo of this blog post) This serum was what made me buy the shampoo and conditioner, I saw that this bottle was telling me that if I used this serum after the shampoo and conditioner, the frizz and curls I have hated for ages will be calmed and relaxed, so I tried it out, I applied a small blob of the serum on the tip of my fingers and mixed my hands together to get the serum on both hands, I applied at the ends of my hair first then worked myself up to my roots. 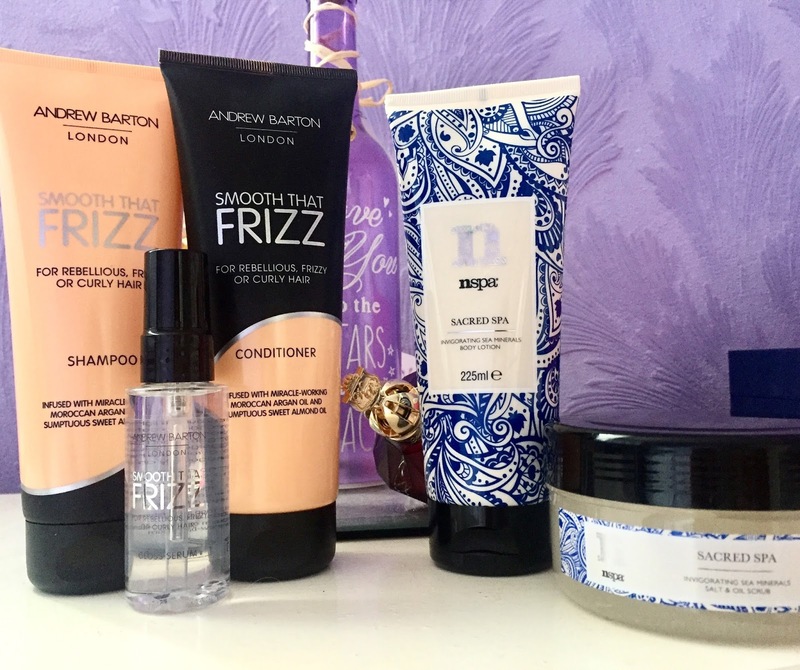 I didn't want too much product on my roots as I didn't want any greasy look especially just after washing my hair. I found that this serum seemed to melt into my hair as it made my hair super soft and it didn't look like I had any serum in, the formula of the serum was very light as well. After using all the 'SMOOTH THAT FRIZZ' products, it honestly made my hair feel amazing and super easy to style the next day, I personally think that these products are brilliant they did wonders for my hair, I definitely saw a difference in my hair as soon as I applied the serum, even in a few hours after my hair looked fresh, clean and bouncer as well as frizz free. I would highly recommend all the products I have spoken about, they are fantastic.